Our soaps are made with only the finest ingredients, including fresh goat milk from the well-loved goats on our family farm! Our soaps will cleanse, moisturize and soothe your skin. We have a variety of soap types to choose from, so select one that is uniquely YOU – Unscented, Unscented Oatmeal Scrub, Almond, Lavender, Peppermint Poppy Seed, Mild Orange, Citrus Blend, Spicy Swirl, and Gardner’s Delight Hand Scrub. Our rich and creamy moisturizing lotions come in mini (2 oz) bottles – the perfect size to tuck in your purse! Our lotions are available in 5 spectacular varieties for you to choose from – Unscented, Almond, Lavender, Peppermint, and Lemongrass. Getting Married? Looking for a truly unique wedding favor to compliment your dream wedding? 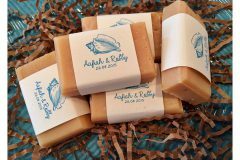 Consider pampering your guests with our new line of personalized goat milk soaps and lotions. Your friends and family will appreciate receiving favors that are both beautiful and practical. Thank-you for sharing our special day! We are bubbling with excitement because you shared our special day! From my Shower to Yours!